Dave Zweigle, the Assistant City Manager of Tehachapi, California and Robert Chamberlain of Morrison, Colorado were both killed when the L-29 Delphin they were flying crashed during a 4th of July Air Show in Tehachapi. 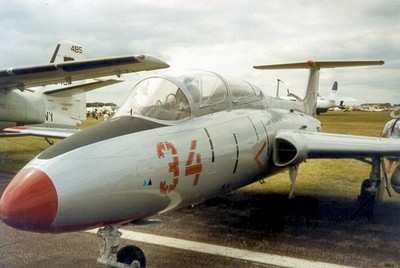 The Tehachapi News reports Zweigle was piloting the Czech-built L-29 at the time of the crash. It was one of three of the jet trainers participating in the air show Saturday. Chamberlain was the president of the Inter-Canyon Fire Protection District, according to Denver Television Station ABC 7. A witness,Jeannette Crounse, who lives near the airport said she saw the accident happen. “We heard them flying over. I said, 'I need to check this out.' It was just in time to watch them go down in the road. I was stunned. “It went right straight down,” she said. “We saw it hit. There was a huge billow of black cloud right in the middle of the road.” A subsequent fire threatened several homes in the area, but it was contained by local firefighters and residents. The Tehachapi News reports that Zweigle had been in the process of refurbishing the vintage trainer for several years, and was preparing the airplane for its annual. The accident is still under investigation.